Home Urban Development Inside the Audacious Plan to Eliminate Traffic Deaths in L.A. Inside the Audacious Plan to Eliminate Traffic Deaths in L.A.
Valentina D’Allesandro was 16 the night she died three years ago. A passenger in a Ford Mustang, she was partially ejected through the passenger window when the driver ran a red light and crashed into a fence. The young man, who’d been traveling at more than three times the speed limit after challenging a former coworker to a race, served seven months in jail. Trujillo founded the organization Street Racing Kills, but it’s clearly not enough. L.A. has one of the the highest per capita rates of traffic deaths in the country — roughly double that of New York City. In fact, the body count has been climbing for the past three years, from 186 in 2015 to 260 in 2016, and up again so far this year. What makes the statistic more galling is that L.A. has been in the midst of a campaign to eliminate all traffic-related deaths by 2025. Called Vision Zero, it’s a radical attempt at reform that has been adopted by 22 U.S. cities as well as dozens abroad. Her explanation? People drive too fast. That may sound counterintuitive in a city known for gridlock, but congestion is part of the problem, leading to aggressive driving the moment traffic lets up. Another factor, argues Leah Shahum, founder of the San Francisco nonprofit that promotes Vision Zero in the nation’s cities, is our broad boulevards: Their resemblance to freeways subliminally telegraphs that they should be driven as if they’re the 405. Though the city adopted Vision Zero in 2015, it didn’t really start investing in it until this year, when Reynolds and her staff began the painstaking process of tweaking 80 miles of street to reduce speed. For starters, they’ve been synchronizing the traffic signals on some streets so that drivers who go the speed limit will hit a string of green lights. Alvarado, where it intersects with 6th and 7th streets in the Westlake neighborhood, will get diagonal “scramble” crosswalks and traffic signals that limit traffic solely to pedestrians for one of the signal changes. 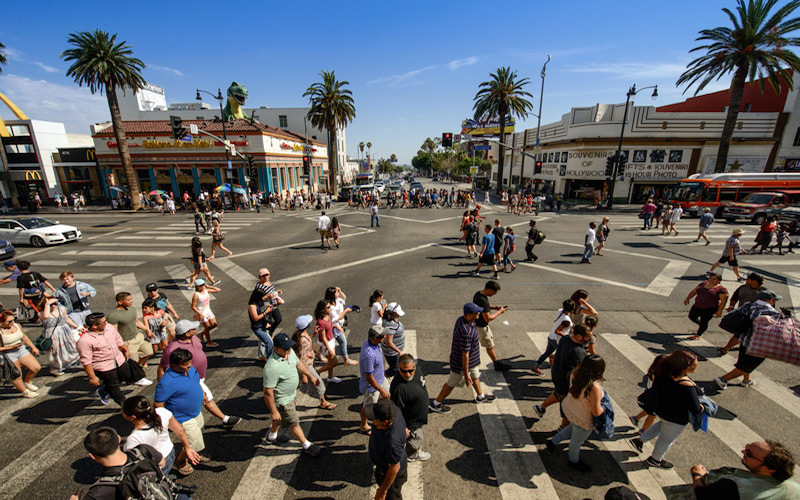 (Since the city installed a diagonal crosswalk at Hollywood and Highland in November 2015, traffic accidents in the intersection have fallen from 13 to 0.) Venice Boulevard was recently broken up with crosswalks that stop traffic by using blinking lights. There are more controversial tools being employed as well, like bump-outs, which extend curbs farther into the intersection from the sidewalk, eliminating a lane at the street corner and forcing cars to slow down when they turn. In some cases, including a stretch of Venice Boulevard in Mar Vista, the LADOT has gone even further, imposing a road diet that eliminates an entire car lane and adds protected space for bicyclists. “What we see is that when cities redesign roadways to send the message to the driver of a lower speed, more often than not, it works,” says Shahum. “If you narrow the lanes, put trees in the middle, it’s proven that these street designs slow people down.” That such changes may well increase commute times a little bit (research has shown that they have only a marginal impact on overall traffic efficiency) is a trade-off Reynolds thinks we should be willing to accept if they lead to fewer lost lives. But judging by the ire sparked by road diets like the one that’s being nixed on Vista del Mar in the South Bay, it’s clear that hearts and minds are a long way from being won over. “We’ve passed gang violence with traffic fatalities. Where is the outrage?” asks Jennie Chamberlain. As the mother of twin 12-year-olds, she is passionate about cycling and walking for transportation, both of which can be risky in her Silver Lake neighborhood. So Chamberlain and her husband don matching reflective Day-Glo vests with their kids each day for the mile-and-a-half bike ride to school on Fountain Avenue, a street in the High Injury Network. She’s been lobbying the LADOT for safety improvements around the school, which sees roughly 600 students arriving on foot each morning. Chamberlain has managed to get eight crosswalks painted and a traffic signal retrofitted with a pedestrian-only phase, but she’s pushing for even more upgrades. Vision Zero money is tight. “They just don’t have enough resources,” says Shahum, referring to most Vision Zero cities in the U.S. 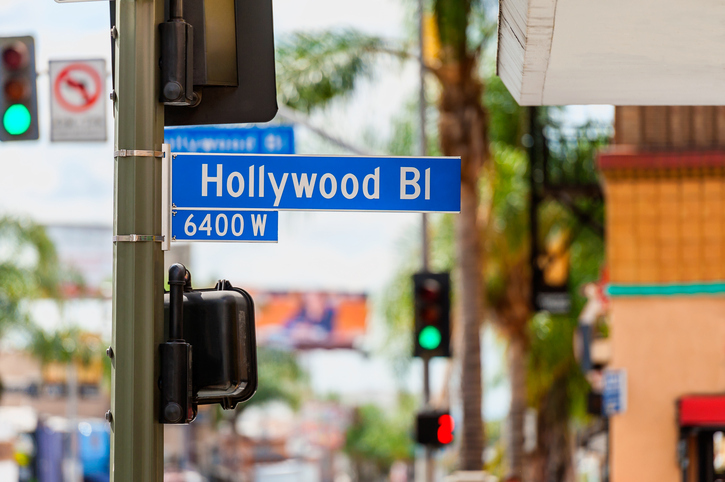 This past May the Los Angeles City Council was set to devote a mere $3 million in funding for Vision Zero for the 2017-2018 fiscal year before having a change of heart and approving $27.2 million. Reynolds and her team had laid out a specific action plan, complete with project- by-project cost estimates, and while the extra funding is certainly welcome, consider that New York City is investing $1.6 billion over five years to improve traffic safety — and that city, a place with far fewer per capita traffic deaths, had its safest year ever in 2016. In reality everybody pays whether or not the city slows traffic. Put aside the incalculable human toll of a fatal accident; there’s also a cost to the city in terms of lost productivity and legal expenses — $1.4 million for each death, according to a 2015 National Highway Traffic Safety Administration report. 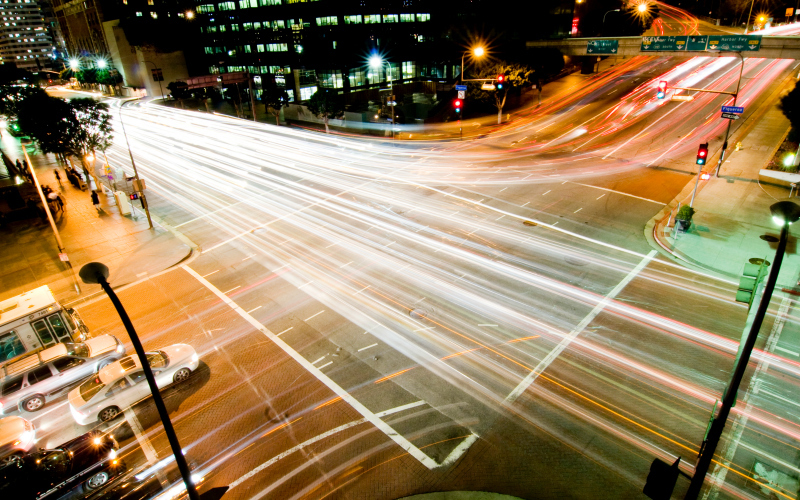 Annually L.A. spends more than $300 million as a result of traffic fatalities. By that math, if the city saves 20 lives in 2017 — less than half of what Mayor Eric Garcetti has promised — it will have recouped its operating budget for the current fiscal year. The bulk of the Vision Zero budget is being spent on those curb bump-outs and the like. But at least $2 million is going toward public education. For instance, a pedestrian hit by a car at 40 mph has only a 10 percent chance of survival compared with an 80 percent chance when hit at 20 mph, according to research. So Reynolds and her team have rolled out billboards showing a driver’s up-close view of a child crossing the street. “At 40 mph on Figueroa, even a good driver’s car can be deadly,” reads one, featuring a pigtailed girl in the foreground, that was recently at the intersection of Figueroa and York in Highland Park (the street names on the billboards change depending on the location). Less than half a mile away, 17-year-old Andres Perez died while crossing Figueroa at Avenue 60 on his way to school. A stencil of the skateboard Perez was riding is painted in the crosswalk. The LAPD also plans to issue more speeding tickets, which have been declining in number. In 2010, roughly 100,000 were handed out; the number dropped to 17,000 by 2015. The reason seems to be twofold: The LAPD relies on laser and radar guns to issue speeding tickets, and it can’t use either unless the LADOT has performed a speed survey on certain streets first. Speed surveys are used to set the speed limit and what’s known as critical speed, which is determined by how fast 85 percent of drivers are traveling during free-flowing traffic; anything above the critical speed is considered dangerous. Engineers complete the surveys, and owing to a lack of staffing and resources, many existing speed surveys have essentially expired. Just 15 percent of the surveys that had been performed in 2010 were still valid in 2016. No survey, no laser or radar speed enforcement. “Without the use of radar, it’s been extremely hard to conduct speeding enforcement,” says LAPD lieutenant David Ferry. “We can give tickets for other things, but nothing impacts collisions as much as speed.” Ramping up the number of speed surveys under Vision Zero has undoubtedly led to an increase in enforcement by the LAPD. It’s a start, though 52 percent of L.A. roadways that require speed surveys remain off-limits to radar. There could be a time in the not-too-distant future when speeding tickets are issued by camera, too. The State Assembly’s Transportation Committee is considering a five-year pilot program that would allow the enforcement devices in San Francisco and San Jose. Of course, whether they’d ever survive in L.A., where even red-light cameras are no longer used, is another question. If Portland is any guide, though, their presence could make a difference: Speeding declined 95 percent one month after Portland installed cameras along one of its most crash-prone roads last August. RELATED: Can California Turn Its Soul-Crushing Traffic Into Renewable Energy? Previous articleCan We Just Stop with the Whole Charcoal Food Thing Now?